Smurfette gets bitten by Poison Spyder! Big thanks to HITMONEY and Jenna for sending Smurfette out to us for some Spyder love. Smurfette is Jenna's 2010 2-door JK, and it gave us the perfect opportunity to R&D some lightweight versions of some of our products and also to finish up prototyping some of our long-awaited 2-door items. The first modification done to most any Jeep typically involves the electrical system. Be it as complicated as a winch, or as simple as a set of off-road lights, and they are done by everyone, to almost every vehicle. But as deceptively simple as most electrical modifications may seem, they are also the most dangerous, due to the common mistakes and lack of attention to detail when doing the installation. JKO Run on Pritchett Canyon! JKO holds it's 2nd annual run in Moab, UT, on the infamous Pritchett Canyon Trail! JKO Easter Jeep Safari Run! Check out the story and photos from our 2nd Annual JKO EJS Run! Follow along in this step by step video as Synergy Suspension installs a Stage 2 kit on UGET IT's '07 4 door JK. HITMONEY and the girls install SpiderWebShades on their JKs. Jeremy installs a set of RCV Performance Ultimate Dana 44 JK Rubicon front axles into his JK in this short video. Gil installs a set of Reid Racing's signature orange heavy duty knuckles on his Dana 44 front end. HITMONEY installs a set of ATX "Crawler" wheels on project Double Ds. Lance, Renee, and Marcy just returned from their Florida adventure at Jeep Beach! JKOTV hits the trails at the Tin Bender Jamboree in the Southern CA desert! Special guest Eddie Casanueva from Spidertrax is on set to showcase their high quality wheel spacers. We get to watch Jeremy from Rock Krawler Suspension beat his JK mercilessly in the Rausch Creek King of the Hammers Qualifier! Gil installs a set of River Raider Off Road's tube fenders on his JK. JKOTV hits the trails in Moab, UT! Special guests Bob Sweeney from Jeeper's Jamboree, Bond from Rebel Off Road, and we take a tour of the Advance Adapters factory to see how the Rubi Box is made! Lance, Camo and Charlene head to Moab, UT, for Easter Jeep Safari. JKOTV hits the trails at Tierra Del Sol and the Southwest Crawlfest this month. Special guests Bob Friar and Steve Beebe make appearances in the studio, as well as a special surprise visit by Miss Marcy and her JK! We check out three different and equally trick Hemi powered JKs and get a little mud on the tires. We build a 2 door JK into a trail capable machine, talk to a few guests, and go snow wheelin. Gil installs a heavily beefed up Rubicon Dana 44 in the front of his Sahara. This month's winner happens to have won the October "Vendor of the Month" shootout. Congrats to River Raider Off Road for being our October JK of the Month! Gil installs a Rock Krawler JK 5.5" X Factor Plus Long Arm System on his JK. Need a part for your JK? Check out our constantly updated Vendor's database for all of your needs. Gil installs River Raider Off-Road's awesome skid plate on his JK. Venom's 4 door JK is definitely "Overkill". Joe's 2007 4 door Rubicon hits the rocks Texas style. Robert installs a Poly Performance Synergy Stage III suspension kit on his 2008 Rubicon Unlimited. Check out Jeff Sparks' awesome 2007 JK in this month's feature. The first official JKOwners run was a smashing success! Ok, so maybe "smashing" isn't the right word to use when talking about Johnson Valley and JKs! Back in September of '08, Dan Dubose of Blue Torch Fab in Birmingham, AL, received a private message about Viktor Whitlow, a young Army Reserve Veteran who had his Jeep vandalized in the parking lot of his college campus. The vandals broke into his Jeep TJ, destroyed the interior and cut up the seats, slashed the tires, spray painted all over it, including painting "Soldiers are Murderers" on the hood. Safari Straps sells a netting system of polypropylene webbing with rings and powder coated cam buckles that looks like a lightweight version of the netting system used in the military to hold cargo to pallets, but much cheaper and much more user friendly. April's JK of the month belongs to SASQUATCH. Check out SASQUATCH's 2007 Redrock Rubicon here. Billavista installs a set of Twisted Stitch seats. 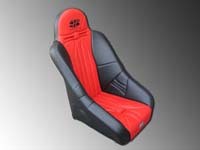 Find out what a high quality seat can do for you! In 1952 several residents of Georgetown held a meeting to discuss the possibility of an organized jeep tour from Georgetown to Lake Tahoe, via the Rubicon Trail. What began as a Rotary Club effort to boost the economy of Georgetown, CA, still continues to play a major role in Georgetown's business community. The 2007 and newer Jeep JK is defiantly becoming one of the most popular SUV’s (I hate that term) selling today. What is not to love? Wider stance, better suspension, better factory seats, modular hardtop, power windows (yes I like power windows), easily removable fenders and FOUR DOORS !! Its nice to be able to stuff people in the back seat without feeling bad for them. I also haul a lot of military gear so the added space is a nice option. What’s not to love? Oh yea, the typical Jeep issued bumpers.